Have You Ever Grown a Fava Bean? Would You? What the heck is a Fava Bean? For the last several years I have added this delicious legume to my garden. Not only is it great to add nitrogen to the soil, very cold hardy, but it is very nutritious as well. Fava beans are one of the oldest plants under cultivation, and they were eaten in ancient Greece and Rome. Fava beans are in the pea family, even though their name suggest they are a bean. This is why they are cold hardy unlike other true beans. They are popular in Mediterranean cuisine with a distinct creamy flavor. You can eat them fresh or dry. Dried they store well and can be added to soups or any bean dish. Fresh, they can be added to salads and pasta dishes. Fava beans are great steamed and served with olive oil, salt, and lemon. Fava beans do not tolerate hot temperatures, therefore plant them as soon as the ground can be worked in the early spring or in my case in USDA zone 8, late winter, January to be exact. 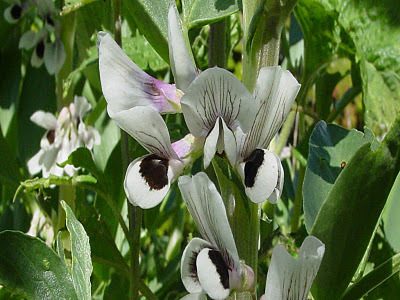 Fava bean can be planted in heavy soil as long as there is good drainage and the soil has been amended with compost and a well-balanced fertilizer. Fava beans will improve your soil, so it’s a good idea to plant them in less than perfect spots in the garden. Soak the seeds a few hours before planting to help with germination. Plant 1 1/2 – 2″ deep 6-9 inches apart. I like to stake my fava beans with some old branches 2-3 ft tall stuck into the soil on either side of the plant. Usually this is enough unless we have high winds, then a little hemp twine around the plants and stakes will do. Fava beans are usually ready in 4-6 months to harvest. 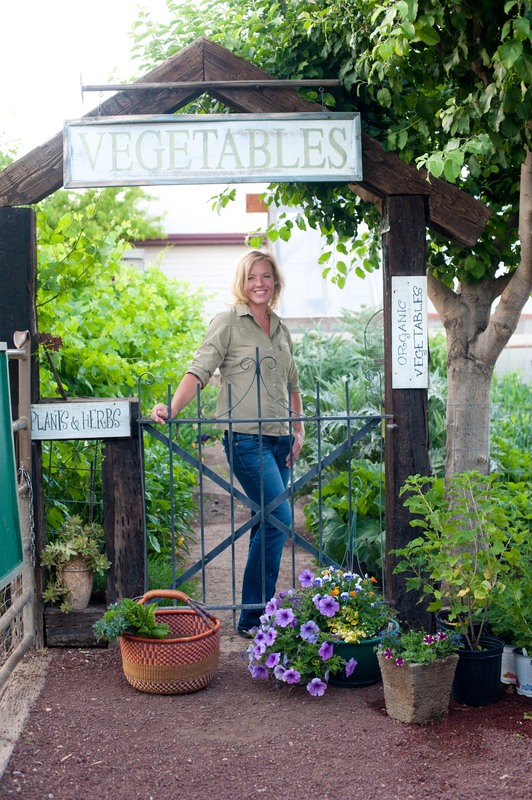 You will be surprised how neat they look in the garden. The beans grow on bushy plants with tapering leaves, yielding anywhere from 25 to 50 pods per plant. The pods resemble pea pods in shape, although they are much larger and lined with a pillowy white material that protects the seeds inside. Give plenty of water throughout the growing season. Pinch off the tops of the plants when the first pods have begun to form. This aids pod formation and discourages blackfly. Pick the pods when they have become swollen. You can see a slight definition of each bean inside the pod. Do not allow the pods to be too mature because they will become leathery and tough. Continuous harvesting will extend the crop season. Broad beans (another name for fava) are beast picked and used fresh. Any extras can be frozen or dried. Once your plants are tired, retire them back into the soil. You may need to chop them up a bit, but you can just till them in or add them to your compost pile. Whatever you choose, don’t toss them into the trash. These guys are valuable! The smaller the pieces the faster they will decompose. Favas are commonly used as a cover crop. They are big nitrogen fixers. Now why wouldn’t you grow these beauties? 1 cup quinoa, 1 lb shelled fresh or frozen fava beans, 2 med. lemons, 2 ripe avocado, 2 garlic cloves, 2 bunches of breakfast radishes halved lengthwise, 1 cup purple basil leaves chopped, 1 T ground cumin, 1/3 cup olive oil, 1/4 tsp chili flakes, salt and pepper to taste. Cook quinoa and rinse with cold water and leave to dry. Toss fava beans into a pan of boiling water and boil for 30 seconds and immediately drain in colander and leave to dry, then press each bean with your fingers to remove the skins and discard these. Take the lemons and use a small sharp knife to slice off the top and base. Stand on long end and cut down the sides, following the curve to remove the skin and white pith. Over a large mixing bowl, cut in between the membranes to release the individual segments into the bowl. Squeeze the juice from the membrane into the bowl with the segments. Peel and stone avocados. Slice thinly, then add to the bowl and toss to cover in the lemon juice. 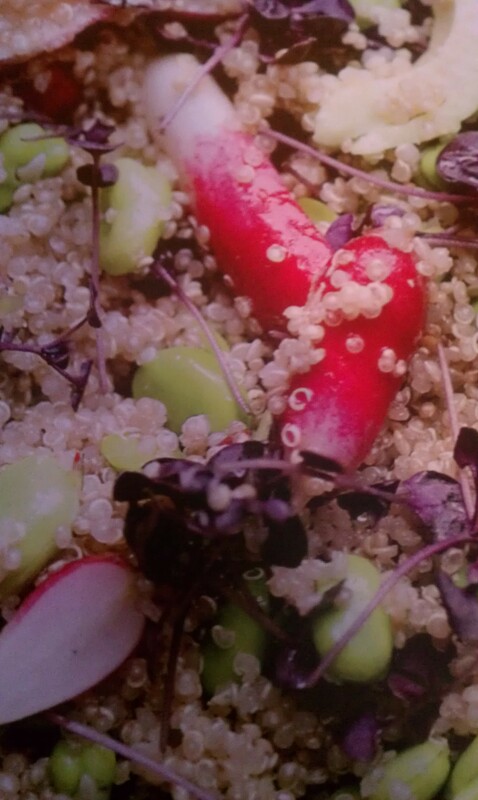 Once the quinoa is dry, transfer it to the bowl. Add the fava beans, garlic, radishes, half the basil, cumin, olive oil, chili flakes, and salt and pepper to taste. Toss gently and garnish with remaining basil. Great Healthy Spring Recipe! OMG I *love* fava beans! Easy to grow, abundant producers, delicious, no washing/easy prep (harvest a bit before they’re tough and no need to skin the seeds). And gophers couldn’t care less! Snails may nibble pods but not like greens; you can get the beans before they do. Try,’em! And thanks for the tip on cutting off tips to discourage black aphids; that’s the only serious pest I’ve seen (and then only in cool and wet weather; dry/heat gres rid of thrm).